Autumn is the season of plentiful fresh local garlic and pumpkins. So what better dish to make then an Autumn pumpkin & garlic soup. Combining these ingredients with some of the prescribed herbs and spices of Autumn makes for a perfect seasonal recipe. Garlic has some wonderful health benefits. Avoid buying imported Garlic, this is of inferior quality and will not provide the same health benefits as the local organic varieties. For another take on Autumn and for another soup recipe read Shura’s article in Nature and Health Magazine here. 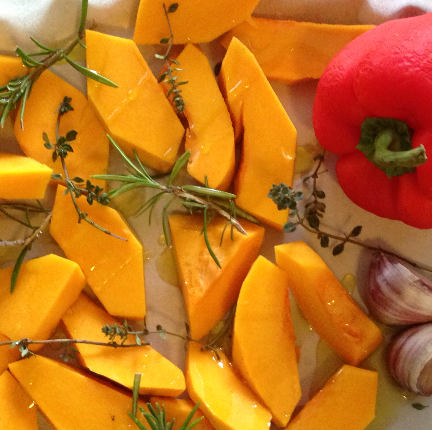 Place garlic, pumpkin, capsicum, thyme and rosemary in baking tray. Drizzle pumpkin with 1/2 oil quantity and bake at 220°C for 20 mins, turning occasionally. Remove capsicum once the skin has blistered, reduce oven to 190°C and continue cooking pumpkin until tender. Peel capsicum, remove seeds and slice finely. In large saucepan dry fry spices until fragrant, add remaining oil and onions and cook until softened, add pumpkin pieces and stock and squeeze in roasted garlic. Season to taste, bring to boil then simmer for 10 minutes. Process soup in blender until smooth and serve with capsicum and garnish of herbs.